In recent decades, the issue of abuse in the Church emerged from the shadows and been recognized publicly as a major failure of not only those individuals directly involved but of Church leadership. The harm caused by inaction to stem abuse is arguably the greatest scandal in the Church in our time. Last week, Pope Francis expressed shame for the Church’s failure to listen to and defend survivors of abuse at the hands of the clergy. He lauded the abuse survivors who, against all hope or painted as discredited, did not retreat from seeking the truth and justice. Pope Francis acknowledged the Church’s shortcomings in not listening to the survivors of abuse. Pope Francis’ shame in this instance is specifically related to sexual abuse. Indeed, within the Church, the single word “abuse” is colloquially understood to imply “sexual abuse.” This is both appropriate, because that is the form of abuse that is being actively dealt with, but also regrettable, because other forms of abuse exist in the Church. In many cases, the Church seems to be following a similar path in dealing with these other types of abuse as was followed in addressing sexual abuse. Victims of other types of abuse are being ignored, neglected, and/or ridiculed. If this situation is not rectified, Pope Francis or his successor will one day have to proclaim again his shame for the Church’s failure to listen. With the fervent hope of averting further failure in the Church’s dealings with abuse, we are writing to you with a sense of foreboding to report instances of abuse that may also be developing elsewhere in the Church. Specifically, although anecdotally, we wish to alert you to a range of abuses at St. Isabel Parish in the Diocese of Venice in Florida that have shaken the faith of many and that continue to be ignored despite sincere and prayerful pleas for relief. The abuses span the spectrum of possibilities and include administrative, liturgical, canonical, financial, and personal elements. We briefly enumerate several of these here. The pastor of St. Isabel was placed on administrative leave fully two years after an allegation filed with the Ordinary of the Diocese of Venice of unethical financial interaction with a parishioner by the parishioner’s absentee family. In the intervening two years, the Ordinary gave no notice of the allegation to anyone except the civil authorities, not even to the pastor. The investigation by the civil authorities resulted in a declaration by the county sheriff that the pastor was innocent. At that point, the pastor was placed on administrative leave by the Ordinary. The local press was notified of this action even before parishioners were notified, seemingly to maximize embarrassment to the pastor and harm to the parish community. Those shocked by the announcement at a Saturday evening Mass exited the church to encounter media cameras and microphones. Only after the two-year period, the dismissal of all charges, and his placement of the pastor on administrative leave did the Ordinary begin his own investigation. Even then, prior to investigation, the Ordinary informed the parishioners that the matter would be referred to Rome. If the Ordinary believed that unethical behavior had occurred, he had the obligation both immediately to protect the parishioners by placing the pastor on leave and then begin his own unbiased investigation. Neither obligation was honored. The procedure employed violates Book VII, Part III, Title III of the Code of Canon Law; and it was abusive to both the pastor and to St. Isabel parishioners. In violation of GIRM 357, the texts chosen for Sunday Mass at St. Isabel do not always follow the Common Lectionary. Sunday Solemnities have been replaced by texts reflecting the substitute priest’s personal piety. Some individuals who are not in full union with the Church and are required to refrain from receiving Holy Communion themselves not only receive Communion but are assigned to serve as extraordinary ministers of the Sacrament. The parish musician was placed in a position by church administration wherein he had no recourse but to resign. At the time of this event, the substitute priest suggested from the altar that the musician’s resignation was a complete surprise. The health insurance of the parish nurse was terminated two days before a previously scheduled operation and prior to being notified that her contract was being terminated. Parishioners have been threatened from the altar that if they are unhappy with the priest temporarily assigned to the parish, St. Isabel could be closed. They were told that if they do not like the assigned priest, they should go to churches of other denominations. They have come to the church to pray at time when the church is purported to be open only to find it locked; their license plates are photographed in the church parking lot by staff; prayers for the pastor are not included in liturgical celebrations and are actively discouraged; lights are turned out, and the microphone is turned off in the middle of prayer gatherings; access to the facilities for church social gatherings and bereavement lunches has been denied. Membership on the financial council has been changed to exclude those who wish to monitor church expenditures in favor of weakly associated parishioners specifically selected to do the bidding of the parish staff. The abuses enumerated here vary in severity, and the list is not comprehensive. However, just as the sexual abuse of individuals may have begun with inappropriate but less severe actions, the unfettered growth of those actions resulted in the greatest Church scandal of our time. Similarly, the abuses of Church law and of sincere and dedicated people enumerated here carry the potential to also develop into a mutated but similar public scandal. Such abuses must not be tolerated or ignored. To counter the above abuses, over 500 St. Isabel parishioners have joined together in “Parishioners for Justice.” This organization sponsors weekly prayer services for our pastor, draws parishioners together for social events, and strives to inform and interact with the Ordinary about the pressing matters of abuse. Parishioners for Justice has raised over $150K to provide defense for the pastor of St. Isabel and to promote justice. We are convinced that abuse and injustice in all their forms infect the Church to its detriment. Although we would prefer to spend the funds raised on acts of charity, we profess solidarity with the victims of sexual abuse who would not back down in their search for truth despite failure of the Church hierarchy to listen. We will not back down from exposing the abuse we have encountered and been subjected to. A committee of parishioners of St. Isabel has met with the Ordinary of the Diocese of Venice in Florida twice seeking to restore integrity and to have the instances of abuse resolved. These efforts have been met with disinterest and inaction as the abuse metastasizes. We ask that you learn more about the situation at St. Isabel Parish by visiting https://parishionersforjustice.com/ or contacting us at parishioners@parishionersforjustice.com. We earnestly pray that we can rely on your interest and support to eliminate all forms of abuse from the life of the Church. Please remember St. Isabel parish and it parishioners in your prayers. As always thank you pfj for your faithful work. We can only pray that the bishops receiving this letter will be inspired and confident to raise questions and speak out about Bishop Dewane’s actions and inactions. 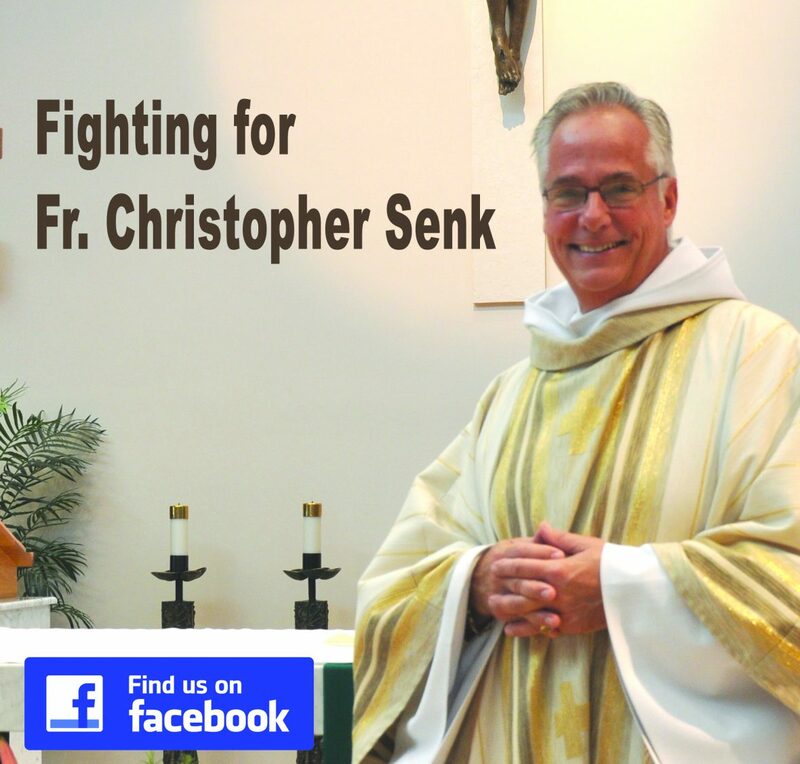 We can hope and we can pray that Father Christopher Senk has a fair hearing and positive good resolution from church authorities..SOON …and that he be given back all his rights as a human being – and also as a priest. As we see it – – up until now it has not been fair. How is the way Father has been treated unlike the way our country is building walls to keep people out of our country and separating families — mothers and fathers and scared children in detention centers….Father’s plight reminds me daily of the similarities —he has been punished and detained for sure. For me it is sickening. This is not the Church I have known for 79 years! I can only imagine how FATHER FEELS! Think about that. One day you are in your house and authorities come and give you an hour to get your things you can carry away in a car…. and get out of your house. You have lived in it for 14 years! That is it! He was treated like a criminal and never had a hearing or explanation. He is a good person. Is this my Church doing this to someone?? This should never have happened to Fr. Senk. He is just like you. Is this how it should or would have been for you or for me or my loved ones???? Well, this was how he was treated. It makes me cry. I know we can only imagine with how he feels… accusations, insinuations and abandonment, too. I am sure Father Senk can now identify with the hurt and anger and disappointment and shock that many of the refugee families or unjustly imprisoned must feel . Where was and where is the Bishop-Shepherd now and then standing in Father Senk’s world? I too thank the PFJ group for being there for Father. I DO expect my church to stand up for the downtrodden(THOSE NOT TREATED RIGHT) -just as many of us hate abortions etc….we must and treat them with courageous loud voices of justice and love. I ALSO HATE HYPOCRISY! I hope and want the Bishop of Venice to be a voice of justice and pick up the phone and call Rome and the Vatican and tell them that since nothing NEW has been discovered…after all this time—-.nothing new has been found and since he has not heard from them about anything that is different than the original state investigation findings it is only right to end this matter for all concerned . He gave it a fair look and trial— is satisfied with the Vatican findings of no guilt….then the Bishop can. call Father Senk and ask Fathers forgiveness for this long delay. Grant Father’s freedom and welcome him back – give his rights to be a full fledged priest back to him. That was a Sacrament given by God in the first place. It is our teaching that once a priest always a priest. Mistakes and misunderstandings can happen. We can all live with that . that now. When one of us suffers – We should and we Do all suffer. Please end this suffering for Fr. Christopher. Thank you. Sorry so long !